To create the molds, Lewis would cut out strips of plaster gauze, dip them in water to activate them and then place them on her body. Tasha Lewis and some of her sculptures. From now until Nov. 4, South Street’s Magic Gardens, which refers to itself both as an art museum and an “art environment” will showcase the work of Newark, N.J.-based sculpture artist Tasha Lewis. 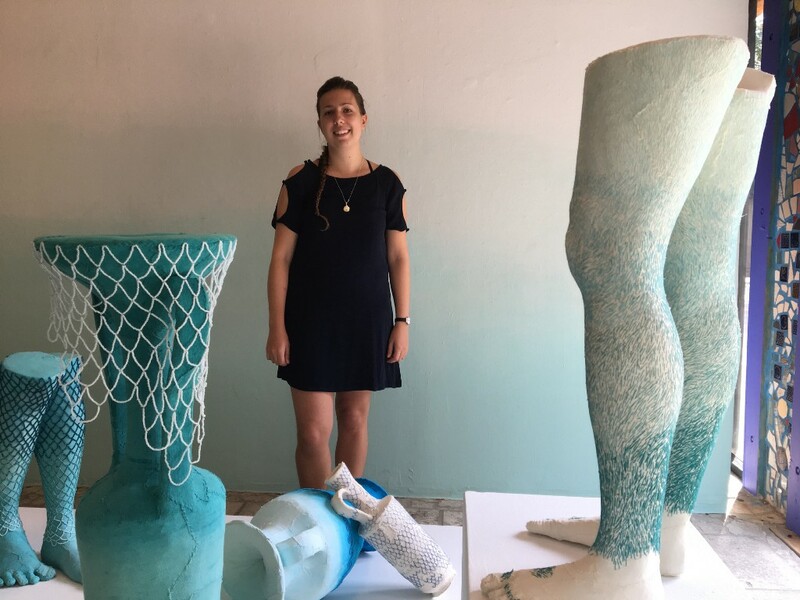 Lewis’ exhibition, titled Ebb Tide: Sculptures by Tasha Lewis, showcases hand-sewn sculptures of busts, standing figures and vessels that are made with plaster and wood armatures. The busts featured in Lewis’ exhibition are near replicas of her own body. She made them by making plaster molds of her own body. To create the molds, Lewis would cut out strips of plaster gauze, dip them in water to activate them and then place them on her body. After about five or 10 minutes, the gauze solidifies. She’d repeat the process until she had enough strips to sew together for a bust. Lewis told SPR “the skin is a metaphor for the flesh because the work is not stuffed. It’s not soft sculpture. It’s actually made out of plaster so it’s very hard and then the fabric is stretched around it so it has a very different feel. It’s like a body. It’s like the plaster is the muscle and the inner armature of wood is the skeleton and then the fabric on top is the flesh or the skin. One of the busts is a recreation of Lewis’ legs, which are embroidered with her own leg hair. The embroidering, Lewis estimated, took at least 70 hours to complete. The walls in the gallery were painted in a blue to white ombre, which is meant to invoke the ocean. The artwork was colored in a similar pattern, with lots of blue — to represent water — and pink, to represent fleshtones. For more information about Lewis’s exhibition, including ticketing information, visit phillymagicgardens.org.